Sometimes finding the best fish tank for your aquatic pets means getting very specific with the volumes of the tanks they live in. 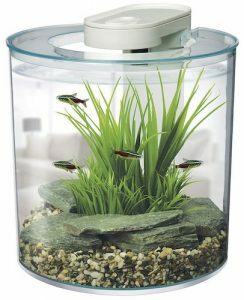 2.5 Gallon fish tanks are a great pay to balance out a small, desktop tank with giving your fish as much room as possible to live happily in their home. Whether your pets are tropical fish, both freshwater fish or saltwater fish, there’s a tank out there for them. 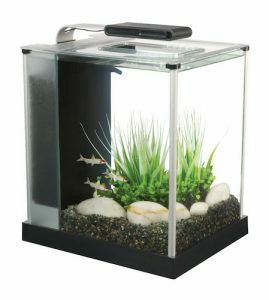 The 2.5 gallon aquarium is a unique option if you want to get yourself a small fish tank that can fit into the corners of offices or dorm buildings but also want to house more than just one or two fish (or want to give those one or two fish maximum room to thrive). Visually, 2.5 gallon fish tanks dimensions’ are pretty indistinguishable from the smaller 2 gallon tank. And it performs most of the same functions. That also means it has the same drawbacks as well, however. You’ll want to consider some things while looking at the list below, some of them are blanket statements while some are more specific to your own fish and preferences for your environment. 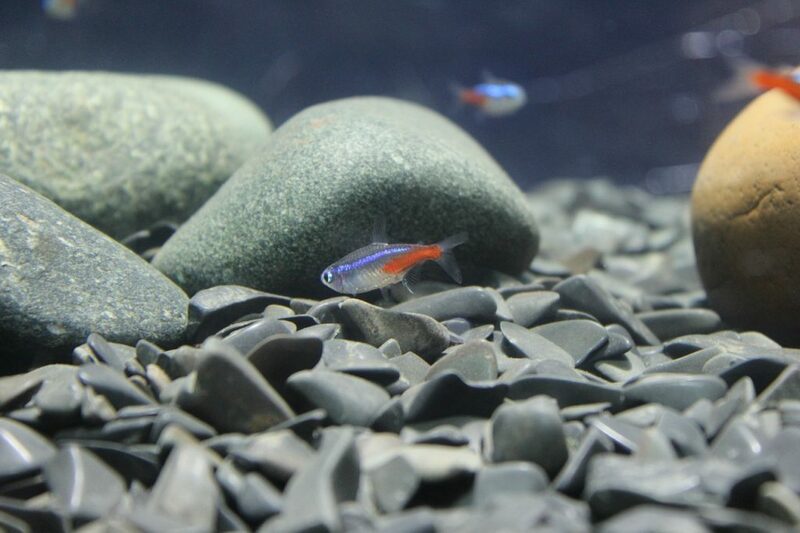 Below are six options for the best 2.5 gallon fish aquariums you can find. These small 2.5 gallon fish tanks are very different from each other, though at first glance they look the same. 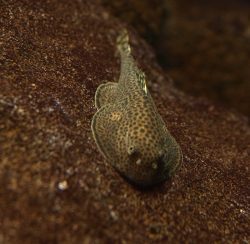 You’ll want to keep an eye on the filtration system, the amount of power it puts out, how that current can effect your fish and how often it purifies the water in the tank. You’ll also want to watch the specs on the lights to make sure they’re not too bright. This is technically a 2.6 gallon tank with a measurement of 11.8 inches by 10.8 by 8.7 inches all around and weighs a slightly hefty 10.1 pounds. It comes with a pretty powerful 31 LED Lighting System and includes a foam block, activated carbon and BioMax rings for the perfect environment for your fish. The filtration system on this small fish tank is powerful with a three stage system that constantly cycles out new, purified water for your fish. The foam block, carbon, and BioMax rings provide both mechanical and chemical filtration. The filtration system itself is cleverly built into and concealed into the design of the tank keeping its sleek design. 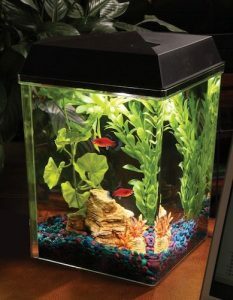 The LED lamp has 31 elements in it that light up the tank and the contents inside. There are, as with everything, some drawbacks, however. The LED light is not a long-lasting device so you’ll want to ration how you use it by turning it off occasionally. The filtration system can also be a bit of a hard current for some fish to overcome. Like the one above, this 2.5 gallon fish tank is actually slightly bigger at 2.7 gallons and measures 10 inches by 8 inches by 9inches all around and weighs a moderate 6.8 pounds for easy mobility should you need it. It features a frameless clear glass view all the way around and comes with a hang on water filter, a thermometer to keep the water in check, and a fish net when you need to remove the fish for any cleaning. Unlike the other 2.5 gallon fish tanks, this one does not come with an LED light overtop. 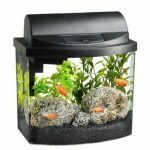 It’s still an ideal little tank for a novice fish keeper and anyone looking to keep small fish, shrimp, or other small aquatic creatures in their home. The plastic lid opens on a hinge to keep out particles when not open and makes the tank itself easy to access when needed. Even with the extra .2 gallons, it fits well as part of a dorm or office furniture set. The only real drawback to this tank (besides the lack of LED light plan to have live plants and no other lighting) is the way the hinges work on this 2.5 gallon fish tank lid. You’ll need to place it correctly to make sure you can actually access it correctly. You’ll want to pay attention to that part but overall, as drawbacks go, this one is pretty low on the negatives scale. 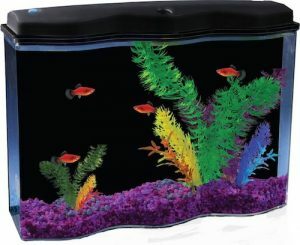 This is a great starter tank for anyone just getting into keeping fish as pets. It’s technically a 2.65 gallon tank that measures 10 inches by 10 inches thanks to a highly cylindrical design that wraps around to a 360 degree view (as the name suggests) for the fish and you. Even with this lack of “back” it comes with an LED lighting system and a filtration pump. Even better, this tank is built for both a tropical or moderate climate which gives you plenty of options about what types of fish you can have living in here. The goal of the design for this tank is to give you a complete view of the inside of the tank, as well as make maintenance as user friendly as possible. Even with the filtration system and LED lamp, the view is almost completely unobstructed on all angles. Its design makes it a perfect countertop small fish tank with tinted edges and plastic planes to give the illusion of real glass. The filtration pump has two cartridges for collecting biological waste and produces a ground up current to purify water. However, small as it is, the filtration system on this small 2.5 gallon fish tank can be loud. The LED white setting on the light can also be a little too bright for some fish so you’ll want to make sure you’re not making life uncomfortable for your fish friends and not keep it on all the time during the day. 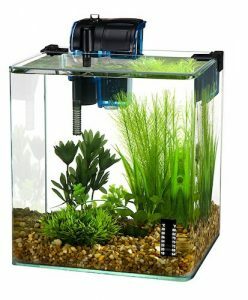 This is a true 2.5 gallon tank and one of the more uniquely shaped and designed ones on this list. It measures 9.25 inches by 11.25 by 8.3 inches all around and weighs a very light 3.5 pounds for easy mobility, should you need it. It comes with an energy efficient 7 color LED that has several options from amber and blue to purple and white. It also includes an internal filtration system for maximum purification. It’s specifically perfect for tropical fish and freshwater fish. The filtration system on this one purifies the tank at a rate of 45 GPH. It also includes a Bio-Chem Zorb 10 filter cartridge that removes odors, discolorations, and purifies the water. The design itself is child friendly and resistant to impact. The black design of it makes the fish pop with color, depending on the lighting you use, and hides the filtration system well. As with any tank, the biggest danger here is the filter and the current it creates. While there are some complaints that the filter is a little bit loud, there is a chance your fish could get caught into the purification system. It’s a filter that works, but can be a little too much for certain fish so you’ll want to be careful of the current and suction on the filtration system. This is one of the smallest 2.5 gallon aquariums that measures 11.4 inches by 12.5 inches by 7.5 inches and weighs a very light 3.6 pounds. It fits virtually anywhere thanks to its very tiny design and features a filtrations system at the top but no LED light. There is a small incandescent bulb, however. The filtration system and cartridge is included as is premium fish food with your order. This is billed as a great starter kit for anyone just getting into keeping fish as pets. The filtration system is small, compact, and quiet. The flow of the filter is calm and quiet and an aquarium set-up booklet and care guide is included to help you get started in creating a h appy and healthy home for your aquatic pets. The big drawback for this one is the slightly clunky design that can make things a little bit difficult. While everything mechanical seems to work fine on this tank, the placement of the filter and the bulb seem to be at odds with each other and, in the worst case scenario, can cause the bulb to get a little too close to the water. You can rectify this depending on how you place plants inside this tank, but overall it can be a bit of an irritating component. This is another little tank that has a true 2.5 gallon volume and measures 16 inches by 11 inches by 5.6 inches and weighs an impressively light 2.5 pounds making is superb for any dorm space or for kids at home. It’s compact and has a unique design on the front of wavy glass that creates a nice aesthetic. It also has an LED lamp with several color options for the light including amber, purple, red, white, and others. It has a multipart filtration system to tackle odors and discolorations of all types. The filter clears out up to 45 gallons of water per hour as it circulates and purifies the water. It specifically goes after organic waste (thanks to a carbon filter) as well as toxins and pollutants. It’s designed specifically to be ideal for beginners just getting started in keeping aquatic pets. The drawback here is one that would be common for any of the 2.5 gallon fish tanks: it’s not meant to last a long time. The pump is not a long lasting one but it’s also not meant to be. So you’ll want to keep a close eye on it to make sure everything continues to work appropriately. Here you have six options for 2.5 gallon fish tanks (some of which, as mentioned, are slightly bigger than 2.5) that range from tall and cylindrical and longer, more traditional looking tanks. There’s some that are 2.5 gallon glass aquariums while some small aquariums are made of acrylic but designed to look as sleek as glass. You’ll want to look over the technical specs as well as the aesthetic properties of these tanks to find the right one for you. 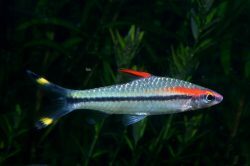 This buying guide will hopefully give you the guidance you need whether you’re a complete newbie to owning and caring for fish or a seasoned veteran just looking for some small, low maintenance ways to take care of fish.